Karen Gorback has a doctorate in education and thirty-five years’ experience as a teacher, counselor, and administrator. Her prize-winning short stories include: “The Curative Powers of Chocolate,” “Hot Wings, Inc.,” and “Dancing With Dreams.” She has also written several one-act plays selected for production at a Southern California theater festival, including The Prom Dress, Cheesecake and Chips, and A Delicate Dance. She has recently had an article published in the national journal of the Society of Certified Senior Advisors. The article is titled "Headed for the Future -- A Baby Boomer's Guide to Going Back to College." Karen is available to speak to clubs and organizations about successful strategies for re-entry education in midlife or midcareer. She is also happy to read from Freshman Mom and sign copies.Karen Gorback has a doctorate in education and thirty-five years’ experience as a teacher, counselor, and administrator. Her prize-winning short stories include: “The Curative Powers of Chocolate,” “Hot Wings, Inc.,” and “Dancing With Dreams.” She has also written several one-act plays selected for production at a Southern California theater festival, including The Prom Dress, Cheesecake and Chips, and A Delicate Dance. She has recently had an article published in the national journal of the Society of Certified Senior Advisors. The article is titled "Headed for the Future -- A Baby Boomer's Guide to Going Back to College." Karen is available to speak to clubs and organizations about successful strategies for re-entry education in midlife or midcareer. She is also happy to read from Freshman Mom and sign copies. Freshman Mom is a contemporary novel written by Karen Gorback. Meredith Lieberman's cozy and sheltered life has ground to a halt. She's finally divorced her husband Joel, who had been spending all his spare time at his desert apartment, and her children are growing up. She decides it's time for her to fulfill her long-deferred dream of going to college to become a scientist. When she brings up her plans with her family, she hears a chorus of objections. Her mother thinks she's had that chance and should find a job instead. Her kids wonder aloud if she should be taking hormones for her condition. Meredith shrugs off the negativity and enrolls in Point Vista Community College. She had expected raised eyebrows and polite laughter when she presented her middle-aged self at the admission counselor's office and was thrilled when her plans were met with acceptance and admiration. It wouldn't be easy, but Meredith's plans were coming together. Karen Gorback's contemporary fiction novel, Freshman Mom, is a feel-good story that works. Meredith has given herself a second chance to live her dreams, and it's just grand watching as her world expands. Sure, there are many pitfalls and life will get in the way, but somehow she keeps up with her roles as a daughter, a single mother, and a budding scientist. There's also some fabulous food floating around the pages of Freshman Mom so readers may find themselves a bit hungry at the lavish descriptions of fancy buffets: hot pastrami, knishes and kugels; warm cinnamon buns dripping with icing and washed down with vanilla lattes. Add in a traditional Jewish wedding, a women's lingerie party, and an intriguing male friend and you get magic, or, at least Gorback did when she penned Freshman Mom, a heart-warming and enjoyable tale of dreams that can come true. Freshman Mom by Karen Gorback is an excellent book that I couldn’t help but relate to on many levels. Meredith Lieberman is a newly divorced mom of two children - a twelve-year-old boy and a sixteen-year-old teenage girl. She has to deal with her very typical Jewish mom and needy sister, plus Joel, the ex-husband, as well. When Meredith decides to go back to get her college education, she gets no support from her family and little from her friends. In Freshman Mom, we walk through a year with Meredith, who is forced to deal with all of the difficulties and joys of life. We share with her the happiness of college life and good grades; being back in the dating game; her son’s sudden hospital stay for an appendix operation; a mother’s new boyfriend and upcoming marriage; the death of her new best friend, and so much more. I am pretty sure that Karen Gorback knew my mom; the dialogue was right out of her mouth. She must have also met my daughter. I am sure that everyone will find something of themselves in Freshman Mom that will make them smile and might even make them cry. I absolutely loved this book and hated that it ended so soon. I can’t wait to see what happens to the Lieberman family next. Freshman Mom is a must-read for everyone with a “Jewish mother,” teenage daughter, or smart talking young son. It is real; I know what Meredith is going through and it's an 'I am not alone in life' story. I am pretty sure the author knew my mother and daughter when she was a teenager. I could feel Meredith's pain, joy and can only hope you write a follow-up. I loved this book! I give this book a ten plus ten plus ten rating. Don’t pass it up; you won’t be sorry. Freshman Mom by Karen Gorback is the story of Meredith. Mom to a teenage daughter and a preteen son, who are the light of her life. When her husband suddenly leaves, Meredith divorces him and tries to move on with her life, but with things tight she has to figure out what she wants to do. With an unsupportive family, Meredith decides to enroll in college and follow her dream of becoming a lab technician. Eventually, her family gets involved and starts being supportive and encouraging while she finds friends at the college who are also helping her through the world of college and weight loss. When her son has a medical emergency, Meredith makes a decision and lets herself become her worse enemy. Meredith makes a few mistakes but does get back on track and, to the astonishment and pride of her children, she starts to really follow her dreams without letting anything get in her way. Freshman Mom by Karen Gorback is a heartwarming story about a middle aged woman who finds herself in need of a job, but not wanting just a job but a career. 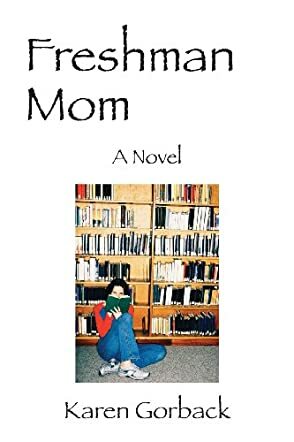 This leads to the story of Freshman Mom and the problems and solutions she finds in her new college life and the life of being a mother to a teenager and an almost teenager. Freshman Mom gives a realistic look at college life and motherhood. I smiled at Meredith's accomplishments and cried when she was down; and then congratulated her when she didn't let the problems or the loss drag her all the way down. This is a story of strength because it definitely takes a strong woman to do what Meredith does when everybody is against her in the beginning. Awesome book! Will Meredith's story continue? I was disappointed to see it end. Dr. Gorback weaves a poignant tale about a single mother fulfilling her dreams. In between, there are stories of the many words which pass between mother and daughter. Dr. Gorback writes about the challenges of motherhood in a real and sensitive manner.. Her style is warm, honest and humorous. The words in this book capture the magic of a unique gift--a depth of never-ending devotion, and a lifetime of acceptance, support, and love. I recommend this book to anyone who is or has been a mother or daughter. Kudos to Dr. Gorback for writing an insightful book for this generation and past ones.